⬅ Who’s at Your Control Panel? Imagine you and your family are in a small boat traveling down a river. Let’s call it the River of Calm. You’re having a pretty nice day when all of a sudden the water current speeds up and you’re struggling to steer the boat. Before you know it, you’re beached on one of the riverbanks. While the River of Calm is every parent’s love, we could easily call the riverbanks their nemeses. On the right side of the river, is the BANK OF CHAOS where meltdowns live. On the left side, is the BANK OF RIGIDITY where power struggles hang out. Now, you may be nodding right now, and smiling inwardly with the thought that your child has set up camp on one riverbank or the other. But, I’d also invite you to take a moment and think about which bank you visit most often, especially in response to your child. Even though you are in the same boat, you may discover that you aren’t on the same riverbank. When your child is crying and losing it, do you respond by threatening them with consequences or do you get emotional, too? When your child is arguing, refusing and repeatedly questioning you, do you meet them head on or do you react emotionally? At times, we all experience chaos and rigidity. When you know where you’re at and you know where your child’s at, then you are no longer reacting to the situation. You are able to mindfully choose your actions. You can guide your child so they learn what to do when they are freaking out or totally stuck. During challenging moments, PAUSE and ASK yourself…CHAOS or RIGIDITY? Am I on the bank of chaos or rigidity? Is my partner on the bank of chaos or rigidity? Is my child on the bank of chaos or rigidity? What’s one thing we can do to get back to the River of Calm? Let me know your answers to these questions in the comments below. Big thanks to Dr. Dan Siegel and Dr. Tina Payne Bryson for the concept of the River of Calm and the Banks of Rigidity and Chaos from their book, The Whole-Brain Child. Such a great – and powerful – post! Thank you for sharing. I love the image. And thanks for the invitation to consider which bank I’m on…and where the kids (or spouse) are. Usually opposite riverbanks!!! Thanks, Krista! Glad you liked it! I love this idea of the canoe! And something I can definitely relate to… thanks for sharing this! Join the Newsletter and download your gift, the 13-page FIVE KEYS THROUGH ANXIETY Guide. Includes a printable Quick Reference Page. We don't send you spam. Unsubscribe at any time. 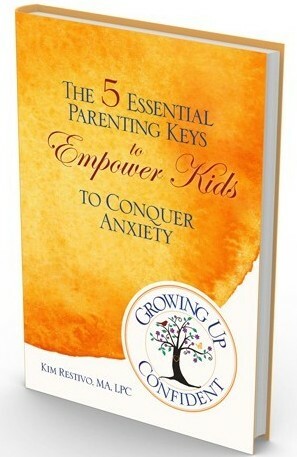 Follow Kim Restivo- Growing Up Confident 's board Parenting on Pinterest. What's the Impact of Creating an Emotional Language? Who’s at Your Control Panel?